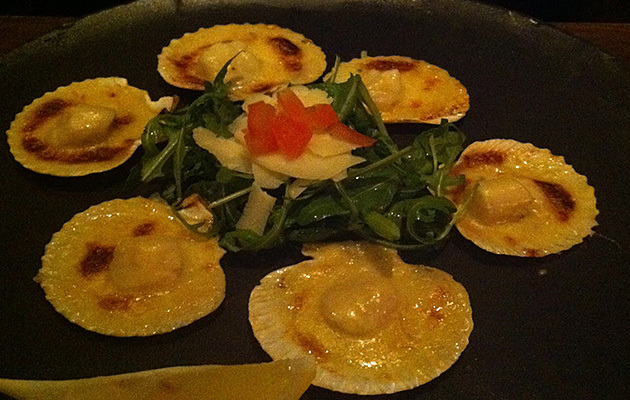 Nestled in the heart of Dalkey Village , on Castle street resides " OUZOS . BAR & GRILL ". The interior reflects a classic french style bistro bar . The type of place to meet up with friends for long lazy lunches or Supper a` deux at the weekend . We received a very warm welcome from Fiona , who sat us down at a table in the front part of the restaurant. Large windows provided great people watching potential but today being good Friday , the main street was fairly deserted . Our charming waitress ran us through the daily specials before leaving us to peruse the large laminated menu. On one side, featured the works of Gerard Byrne , a local artist and on the other, an extensive menu with emphasis on prime Irish Angus and Hereford Beef and locally caught Fish, Brown Crab, Lobster, Scallops and Shrimp as well as a selection from fishermen from Kilkeel in Co Down . We started with 1/2 dozen fresh Irish Queen Scallops @ 9.95 Eur , they arrived in their half shells , were lightly grilled in a rich mornay sauce. The scallops were perfectly cooked. 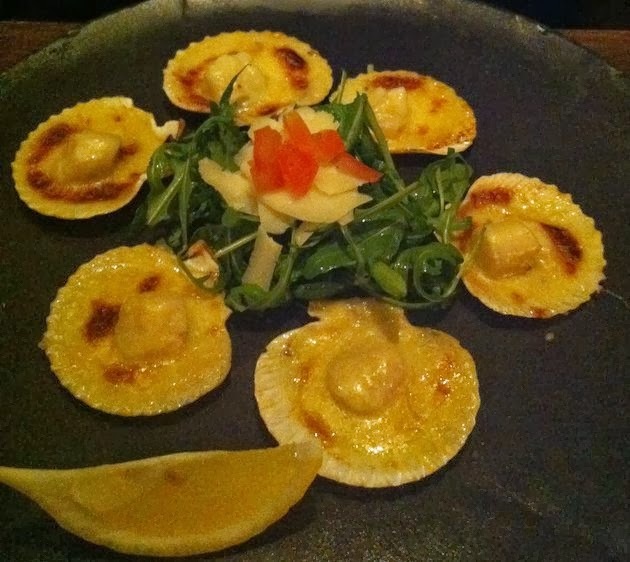 They were sweet and had this melt-in-your-mouth feel that you would expect from fresh scallops and with just the right amount of mornay sauce to complement and not overpower . The Potted Crab & Shrimp @ 8.95 Eur in a creamy dill and mussel sauce with Parmesan crumbs, was more of a gratin than Potted Crab & Shrimp , but with plenty of fresh crab meat and boston shrimps , it was a tasty starter . 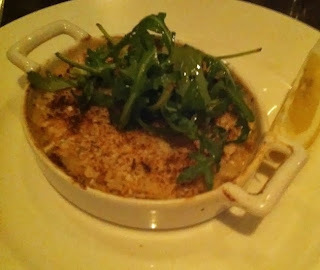 I couldn't taste the dill , just as well as the saltiness of the Parmesan was just spot on to balance the creamy sauce . Our mains of Pan Fried Lemon Sole @ 17.95 Eur were three lemon sole fillets pan fried in a citrus butter. They were moist and succulent . Accompanied by thyme roasted potatoes, buttered carrots and a leek fondue sauce. 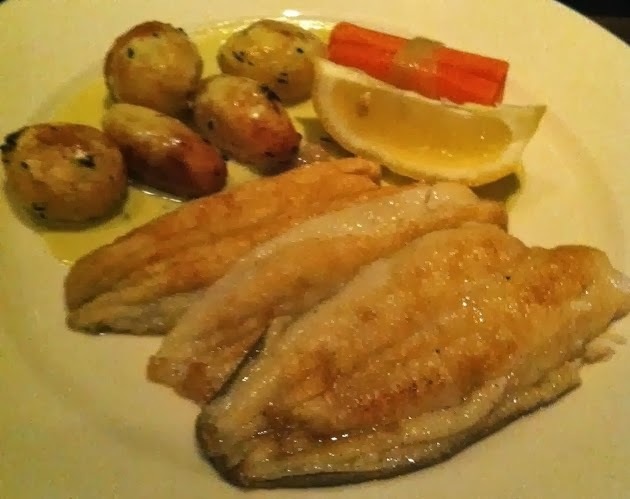 It was a simple , classic and tasty dish , allowing the full flavour of the fish to dominate . 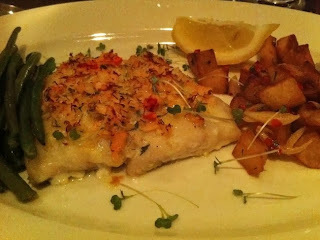 The Devilled Whiting with lobster & Crab @ 17.95 Eur was once again beautifully cooked . The Crab and Lobster topping with a light sprinkling of cheese added an extra dimension to the grilled Whiting. The devil sauteed potatoes on the other hand was unfortunately lacking in a bit of a kick for me. The Dessert Menu was however very disappointing , With Apple crumble, Chocolate Chip Brownie , Bread and Butter pudding and so on..., these are desserts one does at home . When dinning out , I would expect something a bit more adventurous , a bit more thought provoking . it is the final thing you eat and leaves a lasting impression. In all , this was a pleasant meal , using fresh produce , well cooked yet simple and with dishes that appear to be working .
" A Japanese feast ... A Simple Art "